Very excited about this purchase. Bought this small size because we purchased two bigger sizes and won't be able to unroll them until we move into our new house. The pile is short but it is very soft underfoot. Colors are accurate to the close-up photo in the description. My eye sees light grey, teal, and navy on a background of cream. Can't wait to see how the two larger rugs pull the space together. Very good value for the money. This is a nice rug but not what I was imagining it to be. If you are looking for a small statement piece, this is not it. The colors are muted with gray being the overall smear across all colors. Not vibrant. 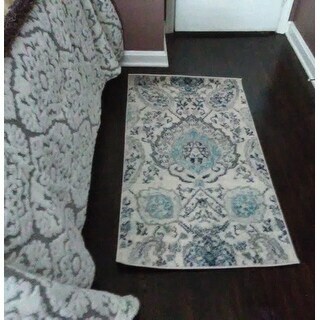 Will use until I find another rug to suit that area. I love the colors and pattern of this rug. It is even more vibrant in person than I expected from the picture online. It is softer than I expected under the feet. Depending on how you use it and where you place it, you may need to follow the recommendation of using a non-skid/non-slip liner below it. Rug tape would also work to keep it in place. I wanted to see if the non-skid/slip bottom of the rug is enough on its own (on top of wooden floors), and I can already see that it will need to be made more secure to be safe in a high-traffic area. I love it, though! It is beautiful. I would buy it in a bigger size if it were available. Nice rug that will compliment any other rugs with similar colors. Love the rugs. Beautiful colors. Just as described. 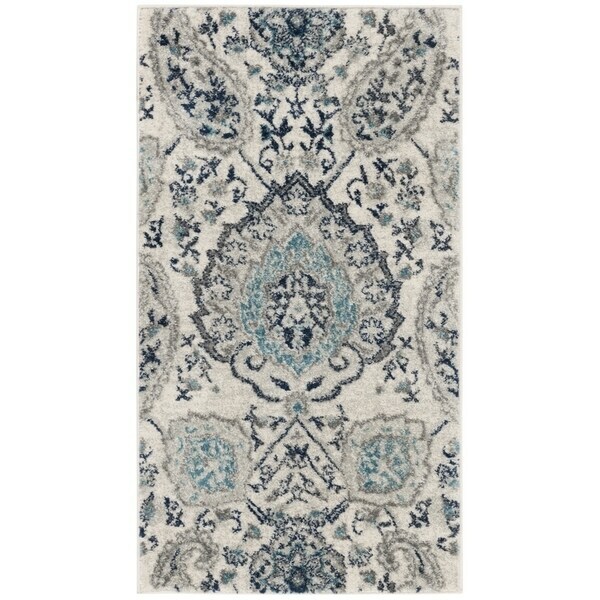 Have the large version of this rug under the dining room table. Ordered 2 of the smaller in front of front door and back. Love the colors and the low pile for by the doors. I purchased this rug for my kitchen. I bought several in the same color and pattern for my house. I love the feel and the color/pattern. You may have to buy a no-slip back for it. The price was great too. Beautiful!!! Great looking and a perfect size for my entry way! It is a wonderful blend of neutral colors and goes great with our furniture and color scheme. Great with greys and beige colors. I would recommend to friends. Love this rug and the colors. Perfect size for my front entry! Rug is beautiful , arrived a day before it was promised. Love this rug for our front door entryway. It is just plush enough with a gorgeous pattern that is just perfect for our home! Matches perfectly with my 8x10 rug! Love! This rug matches the others we purchased for our kitchen and is the perfect size for in front of our sink!